The tightening of the presidential race over the last month has seen Donald Trump take the lead in key battleground states according to many polls conducted in states such as Florida and Ohio. Another state that has more quietly slid into the ‘lean Trump’ camp is Iowa where Hillary Clinton has led in only one of a dozen public surveys released since the party conventions, and none since mid-August. There is a fear among Democrats, and speculation among some prognosticators, that if Iowa has moved in Trump’s direction, so too could neighboring Wisconsin. Thus far, no Wisconsin poll has shown Trump leading the Democratic nominee with Clinton’s Real Clear Politics 5-point advantage there as large as Trump’s 5-point lead in Iowa. While the general consensus is that Clinton has more paths to 270 Electoral College votes than Trump, shedding both Iowa and Wisconsin to the GOP would be an ominous signal regarding Clinton’s White House prospects. But just how closely are the Hawkeye and Badger States intertwined in presidential elections? For starters, the vote for president in Iowa and Wisconsin has been very highly correlated over the decades. The two states have cast their Electoral College votes for the same presidential nominee in 37 of 42 cycles, or 88.1 percent of the time. No other state in the Midwest region has voted more often with Iowa in presidential races than Wisconsin – with Ohio also coming in at 88.1 percent. [The same holds true for Wisconsin, with Illinois equaling Iowa at 88.1 percent congruence]. And so, if Trump continues to hold his advantage in Iowa and carries the state, is it likely that Wisconsin will follow suit? On the few occasions in which Iowa and Wisconsin have parted ways with their presidential vote choice over the last 160+ years, it has nearly always happened in the same direction – the direction current polling suggests will happen in November. 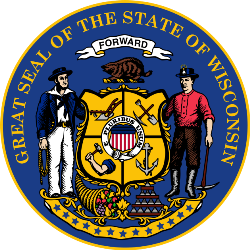 The only other cycle in which the two states parted company was in 1924 when Wisconsin voted for Progressive (and favorite son) Robert La Follette while Iowa cast its Electoral College votes for President Calvin Coolidge. [Without La Follette, Coolidge would likely have easily won both states as Democratic nominee John Davis didn’t carry any Northern state and won just 8.1 percent in Wisconsin]. Not only have the two Midwestern states closely tracked each other in the presidential vote, but also with regard to the margin by which the Republican and Democratic nominees were separated. Since 1984, major party nominees in Iowa and Wisconsin were separated across the two states by an average of just 2.1 points. For example, Barack Obama carried Wisconsin by 6.8 points in 2012 and Iowa by 5.8 points, for a +1.0-point difference between the neighboring states. In six of these last eight cycles this difference came in under two points: 1.9 points in 1984, 1.7 points in 1992, 0.01 points in 1996, 0.1 points in 2000, 1.1 points in 2004, and 1.0 points in 2012. And while the two states almost always voted for the same presidential candidate prior to 1984, they did not mirror each other so closely in terms of relative competitiveness. Over the previous 34 cycles from 1848 through 1980, the average difference in victory margins between the two states was 7.2 points (more than triple the average since 1984) with only four cycles coming in at less than two points: 0.7 points in 1884, 1.8 points in 1888, 1.7 points in 1948, and 0.4 points in 1964. The current state-to-state candidate spread in polling of Wisconsin (+5 Clinton) and Iowa (+5 Trump) is 10 points. The last time the spread was that large between these two Midwestern states on Election Day was 80 years ago in 1936 when Roosevelt carried Wisconsin by 33.5 points and Iowa by only 11.7 points. At the moment, the more heavily populated states of North Carolina, Florida, and Ohio seem to be drawing the candidates’ attention with Clinton hoping to deliver a knock-out blow by carrying one of those states. Without Wisconsin, however, that might not be enough depending on how other more sparsely populated battleground states play out. Next: Will Democrats Sweep the Northeast Yet Again? 3 Comments on "Will Wisconsin Follow Iowa’s Trump Surge?" 1. (last paragraph) Is PA already assumed to be in the D column? 2. IA is indeed a few shades less D than WI, for both macro and micro (HRC-specific) reasons. Firstly, its “metropolis” -known as Des Moines- is noticeably smaller population-wise than at least Milwaukee (perhaps even Madison, to say nothing of Minneapolis of nearby MN). Aside from that, the Tall Corn State has been particularly unkind towards “Her”; it played a not-insignificant role in derailing her previous bid, by handing her a THIRD-place finish, and awarded her a win of a miniscule ZERO POINT TWO % ahead of her stronger-than-expected chief primary rival this cycle. The good news, nonetheless, is that HRC, barring an 1880-like photo finish, can afford(!?) a loss of its 6 EC votes (historically it has never been all that determinative anyway; e.g. in 1976, the D ticket won the election without it; conversely, in 2004, the “Johnny” ticket would have lost the elction even with its votes). Pennsylvania: assumed DEM, yes, given the current state of the race (Clinton leading in last 20+ polls) and the state’s history for a generation of making things close but just out of reach for the GOP nominee. But, you’re right, there still is notable candidate attention to the state on both sides. Actually, HRC would not need IA, WI, and (even) MN in her quest to return to 1600 Pennsylvania Avenue – provided she loses fewer than 2 out of the following: NC, GA, MI, OH, FL, and PA.